There is pride in its people, progress and community. And Weatherford is True Texas. The city is unique and unlike any other with its culture, places and history. What makes Weatherford truly special are the people, families and the relationships. 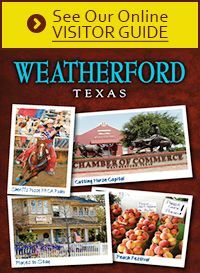 The City of Weatherford exists to form the strongest community in Texas. It exists to create an environment that lets a person, family and company reach their full potential. When we are in a strong community there is trust. A strong community that works together is engaged and there is a sense of belonging, meaning and purpose. Weatherford has a Council/Manager form of government with an elected mayor and four at-large council members serving staggered two-year terms. City officials strive to ensure a quality future through services and development. Even in gonvernment Weatherford exists to create the strongest community in Texas.